Sony tonight announced its much-rumored next video game console, the PlayStation 4. Sony Computer Entertainment prez and CEO Andrew House unveiled the console with little more than a logo and a handful of concepts, though he did say it's coming in holiday 2013. As far as specs, the PS4 has an 8-core 64-bit x86 "Jaguar" CPU from AMD and a Radeon GPU with 18 "compute units" pushing 1.84 TFLOPS of horsepower. It features a 6X Blu-ray drive, 802.11n WiFi, USB 3.0, Bluetooth 2.1, HDMI, optical out, analog AV out, and an unknown amount of internal storage. Lead system architect Mark Cerny -- legendary game dev and, most importantly, creator of Marble Madness -- said that development of the PS4 started five years ago, and since then, he's been exploring how to evolve "the PlayStation ecosystem." Speaking to the limitations of the previous PlayStation console, Cerny said he's been aiming to make sure "nothing gets between the platform and the game." An image of an old-timey hunter shooting Space Invaders ships in the sky (in reality) was used as an example -- later, a more concrete example was given in the PS4's multitasking ability, as well as its ease of use. More on that in a moment. "We were able to create in PlayStation 4 a system by game creators, for game creators," Cerny said. Double Fine president Tim Schafer and Harmonix president Alex Rigopulos were just two of several game devs that spoke to Sony reaching out and asking for input. He next unveiled the DualShock 4, which looks an awful lot like the leaks we saw recently -- it features a new touchpad, a new light bar, a Share button, a mono speaker, and what looks like rubberized grips (in addition to the standard dual analog sticks, d-pad, triggers, shoulder buttons, and four face buttons). Internally, it's still got rumble functionality and a built-in, non-removable lithium ion battery. In so many words, the DualShock 4 looks an awful lot like a DualShock 3 with some new bells and whistles. Cerny talked software next: the PS4 can pause and resume mid-game on a system level, allowing players to multitask. Say you're playing Killzone: Shadow Fall and you desperately need to open another application on the PS4 -- that is apparently something doable on the PS4. He said a second chip dedicated to managing uploads and downloads will also help with the system's usability, meaning you can download games in the background or when the system's off. More importantly, however, you can start downloading a game and begin playing it as the download goes -- pretty great! As far as sharing goes, PS4 is heavy on social interactivity; Cerny said its social network will extend beyond the console to mobile and Vita. He's ambiguous about which platforms that'll mean, but it sounds like Sony's aiming to make it platform agnostic. There's also a Pinterest-esque social aspect for friends to share screens and video, which Cerny said applies to the PS4's "personalization" angle. "You'll see real pictures of your real friends," he said. David Perry went next, and he talked about Sony's acquisition of Gaikai (he was the former head of game streaming company Gaikai, but now he's working with Sony). His game streaming service -- now dubbed "PlayStation Cloud" -- is being employed to run demos on PS4, allowing people to try any game they want instantly (rather than requiring a file download, as it is now). He also said that both Facebook and Ustream are being employed on PS4, using the DualShock 4's Share button; the idea here is that you'll share game clips and screenshots from within your PS4. Beyond just sharing games you've already played, you can also livestream -- to the point that a friend of yours who is spectating can actually jump into your game, via streaming, and help you out. But wait, there's more! Despite Remote Play being a function in the previous PlayStation console, Perry said it's also heading to PlayStation 4. A brief demo of Mark Cerny's PS4 game Knack was shown running on a Vita via PS4; Perry said latency should be imperceptible using Gaikai's (now bolstered) streaming tech. Perry gave one last tease: "everything everywhere." 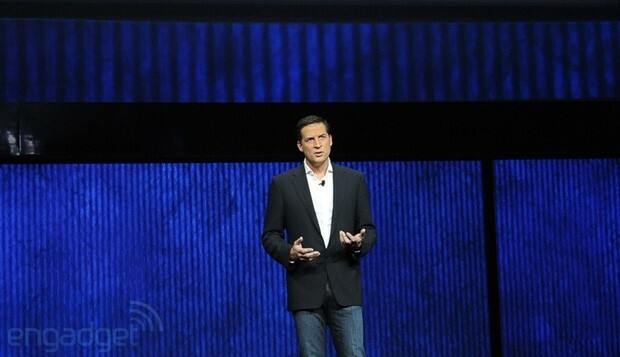 He's hoping that PlayStation Cloud will apply beyond the PS4 and Vita, to mobile devices as well. The service will roll out "in phases," Perry said, without giving more detail, though he did say that Cloud will power PS1, PS2, PS3, and PlayStation Mobile games on the PS4. the system is not natively backwards compatible with PlayStation 3 Blu-ray discs. Check out our liveblog of Sony's event to get the latest news as it happens! NEW YORK, Feb. 20, 2013 /PRNewswire/ -- Sony Computer Entertainment Inc. (SCEI) today introduced PlayStation®4 (PS4™), its next generation computer entertainment system that redefines rich and immersive gameplay with powerful graphics and speed, intelligent personalization, deeply integrated social capabilities, and innovative second-screen features. Combined with PlayStation®Network with cloud technology, PS4 offers an expansive gaming ecosystem that is centered on gamers, enabling them to play when, where and how they want. PS4 will be available this holiday season. PS4 also fluidly connects players to the larger world of experiences offered by PlayStation, across the console and mobile spaces, and PlayStation® Network (PSN). The PS4 system architecture is distinguished by its high performance and ease of development. PS4 is centered around a powerful custom chip that contains eight x86-64 cores and a state of the art graphics processor. PS4 is equipped with 8 GB of unified system memory, easing game creation and increasing the richness of content achievable on the platform. GDDR5 is used for this memory, giving the system 176 GB/second of bandwidth and providing a further boost to graphics performance. The end result for gamers is new games with rich, high-fidelity graphics and deeply immersive experiences that shatter expectations. Social interaction is central to PS4 experiences, so new features were built into the actual foundation of the system's hardware architecture. PS4 provides dedicated, "always on" video compression and decompression systems that enables seamless uploading of gameplay. For the first time ever, gamers can share their epic triumphs with the press of a button. Gamers simply hit the "SHARE button" on the controller, scan through the last few minutes of gameplay, tag it and return to the game-the video uploads as the gamer plays. Gamers can share their images and videos to their friends on social networking services such as Facebook. Furthermore, users can connect their Facebook account with Sony Entertainment Network account. Through PS4, users are able to deepen their connections through co-op play or "cross-game chat". PS4 integrates second screens, including PlayStation®Vita (PS Vita), smartphones and tablets, to wrap gamers in their favorite content wherever they are. A key feature enabled by second screens is "Remote Play" and PS4 fully unlocks its potential by making PS Vita the ultimate companion device. With PS Vita, gamers will be able to seamlessly pull PS4 titles from their living room TVs and play them on PS Vita's beautiful 5-inch display and intuitive dual analog sticks over Wi-Fi networks*1. It is SCEI's long-term vision is to make most PS4 titles playable on PS Vita*2. A new application from SCE called "PlayStation®App" will enable iPhone, iPad, and AndroidTM based smartphones and tablets*3 to become second screens. Once installed on these devices, users can, for example, see maps on their second screens when playing an adventure game, purchase PS4 games while away from home and download it directly to the console at home, or remotely watch other gamers playing on their devices. PS4 radically reduces the lag time between players and their content. PS4 features "suspend mode" which keeps the system in a low power state while preserving the game session. The time it takes today to boot a console and load a saved game will be a thing of the past. With PS4, gamers just hit the power button again and are promptly back playing the game at the exact point where they left off. Additionally, users can boot a variety of applications including a web browser when playing a game on PS4. On the newly designed PS4 menu screen, players can look over game-related information shared by friends, view friends' gameplay with ease, or obtain information of recommended content, including games, TV shows and movies. The long-term goal of PS4 is to reduce download times of digital titles to zero: if the system knows enough about a player to predict the next game they will purchase, then that game can be loaded and ready to go before they even click the "buy" button. PS4 will further enrich users' entertainment experiences, by meeting their potential needs. Launched in November 2006, PlayStation Network, a network service for PlayStation users, now operates in 67 countries and regions*4 around the world with the total number of downloaded content of more than 2.8 billion*5. In addition to a variety of games available in PlayStation®Store, PS4 users will be able to enjoy a variety of services offered by PSN, such as Sony Corporation's Music Unlimited, a cloud-based music subscription service and Video Unlimited, a premium video service, as well as various content distribution services. By combining PlayStation Network with Gaikai Inc's cloud technology, it is SCE's goal to make free exploration possible for various games. In the future, when a gamer sees a title of interest in PlayStation Store, they can immediately start playing a portion of the actual game - not a stripped down version of the game. With Gaikai and PlayStation Store, gamers will be able to experience appealing games and only pay for the games they actually love. PlayStation Network and the cloud will offer additional value to PlayStation gamers. SCE is exploring unique opportunities enabled by cloud technology with the long-term vision of making PlayStation libraries including an incredible catalog of more than 3000 PS3 titles*6 that is unmatched in the industry, mostly ubiquitous on PS4. SCE will announce new details of PS4 and its robust lineup of games from 3rd party developers and publishers, the independent gaming community and SCE Worldwide Studios, as well as further enhancements to the entire PlayStation ecosystem between now and the holiday 2013 launch. Depending on network environment or titles, users may not be able to play games outside comfortably. Exept games that require peripherals such as PlayStation®4 Eye ). Depending on the version of OS or other conditions, users cannot use the application. Number as of December 31st , 2012, including free trials.